We guarantee results, or else you won’t pay a single penny. For most of our coaching programs, your investment will be restored or else we give you the money back. That is, if the amount that you have increased in gross profit after 6 months is not equal to, or higher, than the investment you have made in business coaching, then we will pay you the differential to ensure that you only experience an upside to working with us. You don’t benefit, you don’t pay. We do. Our business coaching strategies have been tested and proven with over 600 businesses in London alone. As long as you make the good-faith effort, do all the required work assigned to you, attend coaching sessions, events and workshops and complete your committed decisions and assignments by the agreed-upon dates – you will see your business improve. We really are that confident in our system. We’ve seen it work; we know it can be done. All you need to do is get up and do it. 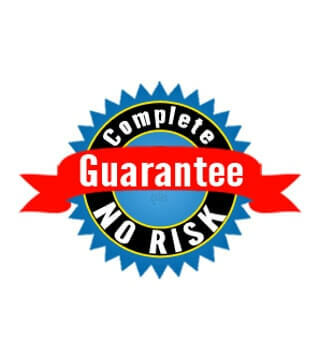 Please note: this guarantee will be discussed and agreed during your initial complimentary strategy session. Every business is different, so we will need to assess how quickly we can achieve those results with where you are at. You literally have nothing to lose, and everything to gain. With this 6-month guarantee, the worst that could happen is that you end up increasing your profits just enough to pay for your business coaching. Because even if you don’t end up increasing that much, we’ll give you the extra bit to make up for it. In other words, the worst that could happen is that you still receive the same amount of profit in your pocket you always have, plus you will have gained advice, coaching and business material from us and become a better leader and entrepreneur. And the best that can happen is that you make loads more profit, have way more free time and craft a well-oiled business machine led by the new you – an absolute rock star leader. What could really be holding you back from getting in touch at this point? Call us at +44 20 7627 1234 or fill in the form below to email us.